Click here to view the interactive infographic. On February 1, 2017, the termination of child support law went into effect. 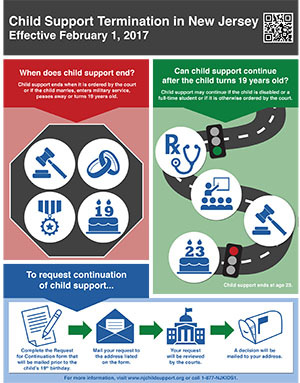 This law established 19 as the age when a child support and/or medical support obligation ends. The new law allows for child and/or medical support to continue up to age 23 if the dependent is still in high school; is attending full-time postsecondary education (college, vocational, graduate school, etc. ); is disabled; if the parties reached a separate agreement; or, if granted by the court. The law applies to all existing child support orders. Click here if you are a custodial parent seeking more information about the termination process. Click here if you are a non-custodial parent seeking more information about the termination process. Custodial and non-custodial parents with a child age 22 3/4 or older as of February 1, 2017, were mailed a Notice of Child Support Obligation Termination on February 1, 2017, with child support ending on May 1, 2017 (and not the child's 19th birthday) as the new law is phased in. Custodial and non-custodial parents with a child between the ages of 22 1/2 and 22 3/4 as of February 1, 2017, were mailed a Notice of Child Support Obligation Termination on February 1, 2017, with child support ending on August 1, 2017 (and not the child's 19th birthday) as the new law is phased in. If you have a child that falls into this age range and did not receive a notice, please update your contact information either online through the customer web portal or by calling 1-877-NJKiDS1. Custodial and non-custodial parents with a child between the ages of 18 1/2 and 22 1/2 as of February 1, 2017, were mailed a Notice of Proposed Child Support Obligation Termination on February 1, 2017, with child support ending on August 1, 2017 (and not necessarily the child's 19th birthday) as the new law is phased in. If your child turns age 19 after August 1, 2017, custodial and non-custodial parents are mailed a Notice of Proposed Child Support Obligation Termination 180 days before your child’s 19th birthday. This very important Notice contains the date the support is set to terminate, information on how the custodial parent may request a written continuation of child support, information on how the custodial or non-custodial parent may provide a court order already specifing when support should terminate and how the amount of child support may change. If there is no response to the first notice, a second Notice of Proposed Child Support Obligation Termination will be sent out 90 days later. If no continuation is granted, the order of support will end as of the child's 19th birthday (or other date specified on the notice). Both parties will receive an updated court order reflecting this change. If back child support is owed when the child support terminates, the non-custodial parent is still responsible for paying that off and the order will still be enforced for the arrears. If you receive an updated order for continued support and wish to oppose it, you may file an application or motion with the court. If there are younger children on the order in addition to the 19-year-old (or older) child(ren), parents may file an application or motion with the court to adjust the child support amount. In order to ensure that all notices and informational updates are received, please confirm that the Child Support Program has your most current mailing address, cell phone number and email address.